I spent a long hot afternoon on Sunday with my HST JD855 using the rear mount blade to grade out potholes and relevel my driveway. After several hours I noticed oil drops on the freshly graded surfaces and checked underneath. Sure enough there was hydraulic fluid dripping off several parts of the underside. It appears to be coming from fairly high up on the engine/transmission housing. This area is under the floors and I have not started diassembling to really isolate the source. 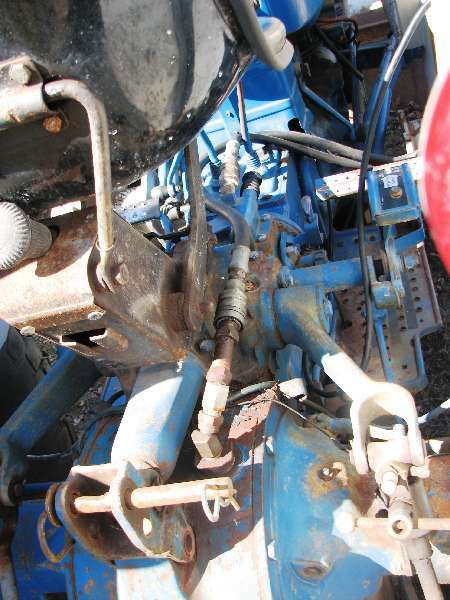 My question is whether an overfilled hydraulic reservoir could be the source of the problem? The temperature was above 75F while I was working. Even cold the fluid has been above the checkered range on the dipstick although it has not caused any leakage like I saw this week. There was still some dripping the next AM but the actual fluid level did not seem to be any lower than it has been since the last tran. fluid change. I appreciate any thoughts you may have on this. Paul put something heavy on the 3ph and lift it a couple of 6 or more times and look for your leak. I would focus on fittings or connections. I always like the smooth looks when everything is covered with sheet metal but yet when times are like this I dislike it as you have to remove it to get to the problem. I'd just try to isolate it to see where it is coming from to get started as it probably or might be just a valve leaking and a 15cent o-ring.